In a small saucepan, scald the skim milk. Remove from heat and add to saucepan honey, butter and salt. Stir together until mixture is about 110°F. In a large bowl, dissolve yeast in warm water. Add milk mixture and stir to combine. Add egg, herbs, and 3 cups whole wheat flour to the mixture. Whisk together until mixed together. Once a cohesive dough develops, place dough on counter and slowly add remaining flour while kneading with your hands (If you cannot incorporate all of the flour, mix in as much as possible to keep dough from sticking to counter). Knead dough for about 10 minutes or until smooth and elastic. Place dough in bowl sprayed with cooking spray, turning to coat. Cover and let rise in a warm place free from drafts, two hours or until doubled in size. Place dough on counter and divide in half. Shape both pieces into oval-shaped loaves and place in two greased 9 x 5-inch loaf pans. Cover and let rise about 1 hour or until doubled in size. Preheat oven to 375°F. Bake loaves for 30 minutes or until golden brown. Remove from oven and allow to cool completely on a wire rack. Fresh or dried, from the garden or from aisle 12 at the grocery store, I am swooned by the variety of plants that, when sprinkled on top of your eggs or tied to your turkey leg or whisked into your aioli, make anything and everything taste better. To me, salt and pepper are wholly overused -- many herbs will add more flavor, and a better one, than the good ol' S & P standby. The same goes for bread. 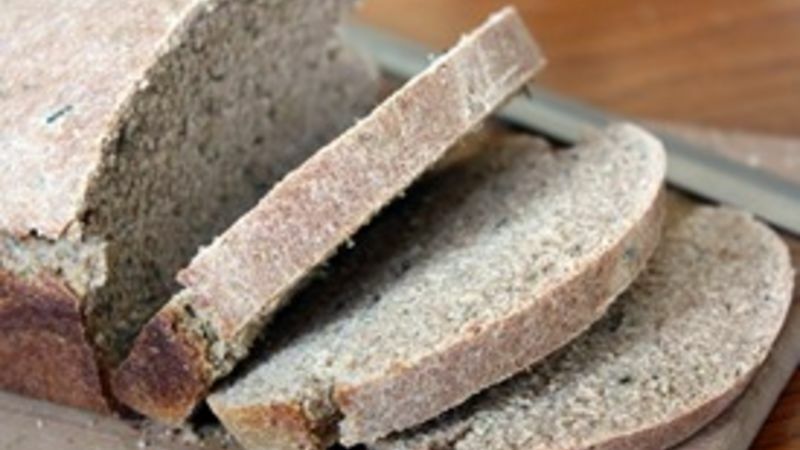 If you're having that I'm-just-getting-a-little-tired-of-boring-old-wheat-bread-but-I-don't-want-to-sacrifice-healthiness-for-taste feeling, you are not alone. Such has been my conundrum for quite some time. And I certainly don't want to add complication to simplicity. So I like to call on my old friend, the herb garden (which, in my tiny little apartment with not much more than a screen door as my direct connection to the outdoors, is my herbs and spices cabinet), to come through in the clutch. The result is Five Herb Bread. I really am a sucker for herbs. Though you might prefer a little less "wa-pow!" when it comes to how many herbs to include in your version of this recipe, I delight in the cornucopia of tasteful herby specks mingling together in my dense slice of wheat. I could really keep adding herbs to this bread with abandon until the loaf became a lovely shade of green, but I think at that point even I wouldn't love to pick out all that's left in my teeth rather than in my stomach. There is still such a thing as overkill. You could add this blend of herbs to really any basic loaf you like to make, but I like to make a smaller, denser wheat loaf so I can use the slices as a slab on which to heap on some of my favorite foods -- scrambled eggs, espinaca con garbanzos or bruschetta. The density and rich taste of the bread allow it to still come through any strong-flavored entrée you throw atop it -- no S & P needed. Feel free to experiment with different loaves and herb combinations, as this recipe is really just a suggestion in the scheme of herb breads. And let me know what you come up with! I've got plenty of herbs left in my "garden" for another creative recipe or two.